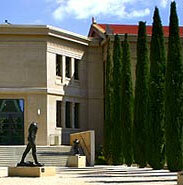 "Tours at the Stanford Museum-Cantor Center"
Dr. Patrick Hunt,President of the AIA Stanford Society, will be giving tours at the Cantor Museum on the Stanford Campus. Free and open to the public. To join the tours, please meet in the lobby a few minutes before the hour. Please note that with the recent opening of the Anderson collection, parking will be a bit of a challenge. Please leave yourself plenty of time to find parking.